Monroe Medical Device Consulting™ LLC provides regulatory and quality assurance expertise, specializing in FDA Class I & II (US) regulatory submissions, Canadian MDL submission and compliance to EU CE marking requirements for technical files and design dossiers. Our quality objectives include assisting companies in meeting the requirements of QSR and ISO 13485 (figure 2) through the audit process. We also provide consulting services for developing short and long-term regulatory strategies for new product development, third-party inspections, and remediation. 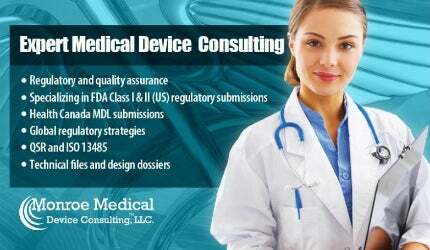 Our goal is to provide high-quality services and reduce the time to market of your medical device. Monroe Medical Device Consulting LLC is governed by the rules and regulations of the country we wish to introduce interstate commerce into the market. For example, in the US, we are governed by the Food and Drug Administration (FDA), which provides the statutory rules, guidance documents and regulations needed to legally market a device in the US. The regulations governing these devices have been developed based on the potential safety risk to the patient. As such, certain guidance documents, recognized standards, international standards, and special controls exist and must be abided by in order to ensure the safe development of medical devices. As an auditing body, we ensure that established companies have a quality management system, which governs how the company will operate with regard to the development and sustainability of medical devices, and that its business practices, documents and quality system meets country specific requirements (figure 3). Monroe Medical Device Consulting LLC brings to the market a level of expertise combined with the knowledge of the most current rules and regulation governing the medical device market. We specialize in electro-mechanical and software driven devices, as well as lasers and fiber-optics (figure 4). What makes us unique is that our services are not limited to a particular device, rather we have established foundational principles to make us flexible and adaptable to work with any type of medical device. Our short device learning curve allows us to work very closely with clients and provide dedicated intelligence to make crucial business decisions in order to streamline their cross-function teams and bring products to market in a timely manner. The future of MMDC is not solely based on our knowledge of the current regulatory and quality arena rules and requirement; our plan is to grow our company in a multi-faceted approach. We will leverage the relationships within our professional networks to introduce our business and services. We will provide a high-level of expert service, while controlling costs and achieving goals similar to larger organizations. This will be accomplished by a reduction of regulatory review time translating in a reduced time to market. Once we establish a solid client base and revenue stream, we will employ additional personnel to supplement our workload in the US, Canada, and Europe. Our long-term growth strategy is through our presence in Europe, in addition to pursuing opportunities and partnerships in the Middle East, India, China, and other Pacific Rim countries, as well as Latin America. Monroe Medical Device Consulting LLC is an independently owned company dedicated to providing regulatory and quality professional services. MMDC’s primary objective is to assist clients in achieving regulatory clearance of their medical devices where previous medical devices with similar technology and indication for use exist. With a combined time span of 20 years working on the design and development of hardware and software devices, ranging from lasers, radio frequency coils, micro-controllers coupled with post-processing imaging analysis, MMDC has poised itself on the forefront of cutting-edge, highly complex medical devices to improve the quality of patients’ lives.